This morning we accessed the rooftop pen and retrieved the unbanded chick. 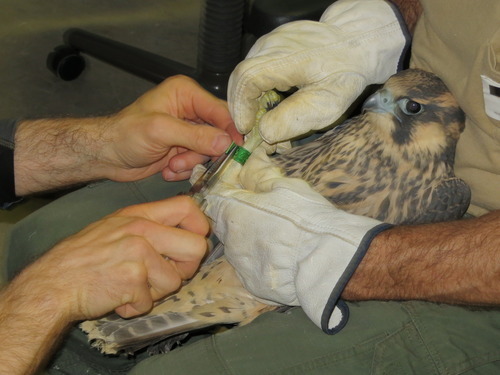 We banded the young falcon with standard bands; in addition we placed yellow electrical tape on the USFWS green aluminum band. This will help us to differentiate between the two juvenile birds as they are viewed from a distance through binoculars during tomorrow’s FledgeWatch event. We also installed an electric trigger on the pen door, which will allow us to remotely control the opening of the door tomorrow morning, sometime after 9 a.m. Both juvenile birds appear to be in fine health, and both parents were as aggressively responsive as ever when we accessed the ledge. 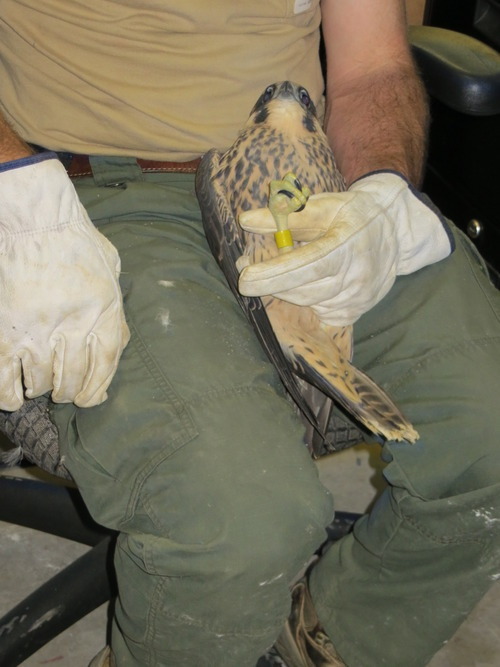 The adult female showed off some new and impressive aerial maneuvers, making it past one biologist’s broom (used to keep the birds from striking us) to knock his hardhat off of his head.